Ask The Bellwether: What can you make on a sock machine besides socks? What can you make on a sock machine besides socks? Circular sock machines are for more than just socks! I've made tube scarves, mittens, and even bath mitts on mine. Roxanna on sockknittingmachines and other lists makes a ton of interesting things -- soap dispenser covers, door-draft-snakes, stuffed animals -- and more! The old Victorian knitting manual available to members of sockknittingmachinefriends has a ton of clothes, of all things, in it -- sock machine knit pieces, sewn together. I plan also to knit a sock-scarf (one end is a sock! though you're not meant to wear it, LOL), gloves, and fingerless gloves/arm warmers on my sock machine. My latest non-sock is a pedicure sock. These are also great simply as flip-flop socks! I used Pat Fly's hand dyed superwash merino sock yarn, though any sock yarn would do; and my 80-needle cylinder in my NZAK with my 40-needle ribber. At the top I carried along my lycra thread for extra elasticity. After knitting on waste yarn and getting it set up in 1/1 rib, I tied on my sock yarn and lycra to start knitting 1/1 rib. break the lycra yarn and continue with just the sock yarn in 1/1 rib for 10 more rows. stop in front and switch out the remaining ribber stitches, remove the ribber, and lift the back 40 (half) needles out of work in preparation for the heel. keeping the yarn in the tension arm, knit 35 rows. re-introduce the ribber, putting every other cylinder stitch onto a ribber needle and removing the cylinder needle it came from. The first row of 1/1 rib is hard to knit, so take it easy and hand-latch those that need it. If you want to reintroduce the lycra thread, wait until the second or third row of ribbing. Knit another sock the same. Now, you aren't done -- granted, there are no toes to close (yay!) but you have live stitches on the foot ribbing. I took a leaf from the professional machine stitchers (thanks April!) and ran my 2 feet length of yarn through all the live stitches on the last row of the sock yarn on the foot. Keep it loosely enough threaded to stretch, and weave in the end. Then I ran some elastic shirring thread through as well to increase its hold. A really cool thing about these is that they don't need sizing -- pretty much one-size-fits-most. And isn't pink a great pedicure sock color, LOL! See a list of all my sock machine posts. 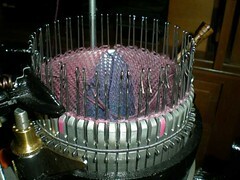 Here are some great sock machine blogs: SoxophonePlayer, The Sock Lady, and Yarn in the Family. Thanks to the Circular Sock Machine group on Ravelry for the pointers! Handknit? Knitty has a great pedicure sock pattern! I recently purchased an antique auto knitter machine. It did not come with a ribber. Can I purchase an aftermarket ribber and ribber arm? OR is there socks that van be made with out a ribber component. I appreciate your help! Depending on the type of sock machine, you may be able to find a ribber for it. There are two new manufacturers, autoknitter.com and erlbachergearhart.com. There is the "mock ribbing" technique to make socks without a ribber, and you might check out the Soxophone Player's blog, he often makes ribber-less socks. He is at https://www.meafordwool.com/. I've seen tabi sock instructions for sock machines; doing designs with colors is difficult, but might be possible -- argyle instructions could likely be adapted to shapes like hearts if you want to play around with it.